With Memorial Day coming up, this is a perfect side to bring to a BBQ. It is also perfect for summer meal prep. Cabbage is a cruciferous vegetable that can withhold marinating in a salad dressing without wilting and can actually get better with time. I had it three days in a row for lunch and it never got old. My favorite topping? Tuna! It was a perfect mix of lean protein, fiber, and healthy fats. Very high in antioxidants, rutin, quercetin, and gallic acid. Have cardio protective properties by helping to decrease cholesterol from the compound, cynarin. Cynarin is seen to naturally lower cholesterol. Artichokes are GAP diet approved and can help aid digestive health and decrease IBS. Very high in fiber which aids in weight reduction. I am obsessed with salads and you will start to notice this as the years go on. I usually love to highlight the vegetables that are in season because they tend to taste so much better raw. Here I am highlighting two different types of cabbage, purple and napa, and two different types of radish, watermelon and daikon. Ataulfo or "champagne" mango add a bright burst of sweetness that pairs well with the spicy dressing. 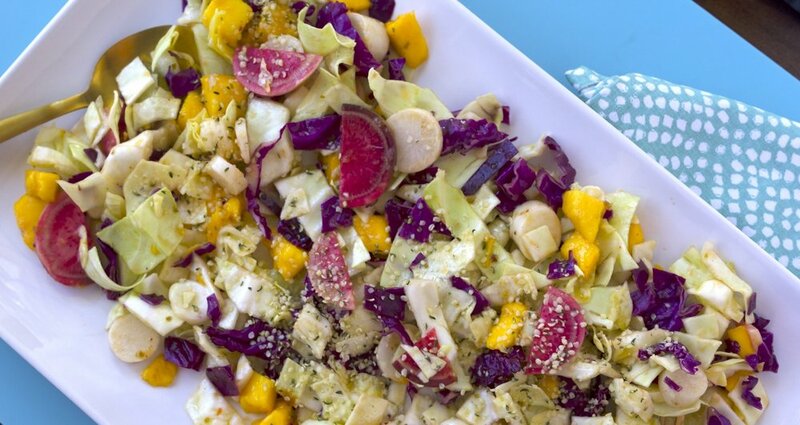 -Place all of the chopped vegetables and fruit into a large salad bowl. -Mix all of the salad dressing ingredients into a jar and shake until fully combined. -Dress the salad and let it marinate in the refrigerator for at least one hour. MACROBALANCED TIP: This salad can be made and used in your weekly meal prep for 1-2 days. I love to use it as a base for my lunch salad. I make it complete by adding grilled chicken or tuna. Nutrition Facts (per serving): 213 calories, 20 grams carb, 15 grams fat, and 1 gram protein. I love to make my own salad dressings at home and there are items I love to add for flavors without many calories. Comment below if you have any good ideas on how to make a low calorie dressing at home. I would love to hear your ideas.